Few nutrients inspire such feelings of devotion and commitment – and guilt and shame – as calcium. Am I getting enough? What about my bones!? Oh no – I better eat more yogurt, seek out fortified foods, and take even more pills! Calcium is no more, and no less, necessary to life than any other essential mineral or vitamin. (In fact, I could argue that deficiencies in magnesium, zinc, potassium, and vitamins D and B12 are both more likely, and more dangerous). Yet for some reason, no other nutrient inspires such slavish, at times even neurotic, concern as calcium. So, how much calcium should we get? Meanwhile, some people say we don’t need to consume any calcium – they even say that calcium can be dangerous. I’m going to say we should shoot for a total daily intake in the range of 500-1,000 mg. I’m also going to say – and this is my big, take-home message – that if we want really want the benefits we look for with calcium (primarily strong bones) the answer lies, not in additional calcium, but in calcium-management nutrients, such as vitamin K, strontium, silica, magnesium, and vitamin D.
So, why am I recommending so little calcium? I might respond in turn: why are so many people suggesting so much? I’ll also add, I’m not the only one suggesting these kinds of doses. The estimable Walter Willett suggests 500-700 mg a day. The fact is, there is almost no evidence that higher intakes do any good. And just to be clear, it isn’t that we haven’t researched it. We have. Again and again. There’s plenty of research out there. It just rarely shows benefit. 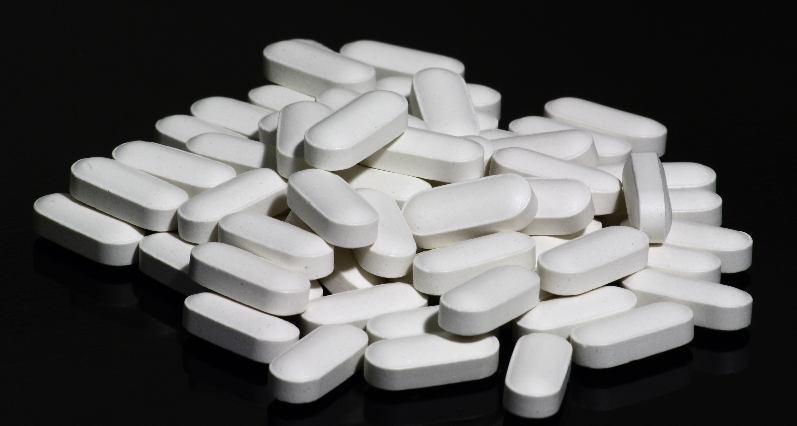 The study authors do point out a single study where calcium supplements (in addition to vitamin D) appeared to have significant benefit – involving frail, elderly women in a nursing home with very low calcium intake to begin with. Which perhaps suggests value if your calcium intake is already quite low. However, the paper’s authors also point out something we’ve heard before: even if we could extrapolate some of the “weak and inconsistent” benefits to the general population, “calcium supplements… probably have an unfavorable risk:benefit profile.” In other words, they might do more harm than good. The risks of excessive calcium are both real, and often overlooked. Again, the data is more nuanced than I’m going to make it sound. But the take-home message is that calcium supplementation, beyond a healthy level, is linked to an increased risk in cardiovascular disease – heart attack and stroke. And the increased risk of stroke is at least as great as the decreased risk of fracture. Assuming that a stroke is medically “equal” to a fracture, this really does tell us that calcium supplements do more harm than good. This data is almost entirely from Western populations, where dairy consumption is high, and fortified foods abound. If your diet is lower in calcium, you might still benefit from moderate supplementation. These studies generally tracked people for a year or two. There’s a chance that reduction in fracture risk takes longer to develop. These data look almost exclusively at studies where only calcium was given. But calcium does not work alone. Not only is there plenty of evidence that calcium management nutrients help the calcium work, they also reduce or entirely mitigate the risks associated with its intake. These nutrients include vitamin D, vitamin K2, magnesium, and possibly silica. They also include the nutrients that naturally occur alongside calcium in food – including those calcium pills derived from food. So, do I, personally, take calcium supplements? No, I do not. Do I recommend them to other people? Usually…. not. Where I do recommend them is where diets are low in calcium to begin with. Or as part of a larger bone formula that contains magnesium, vitamin D, vitamin K, zinc, etc. Especially when the calcium source is some kind of therapeutic food like calcium-rich algae, or bone. Perhaps where people are dealing with very weak digestion, or compromised absorption, of nutrients. But for the most part, if you get at least one serving of dairy, plus an otherwise rich, varied, and vibrant whole foods diet, you’re probably fine without calcium pills. Which isn’t to say you shouldn’t address your bone health at all. Again, calcium-management nutrients are key. More about them next month. I actually suspect that our national obsession with calcium has more to do with the power and influence of the dairy industry vs. any nutritional imperative. Do you remember the Four Food Groups? Grains, proteins, fruits and vegetables, and dairy. Did you ever wonder why dairy had a food group all to itself, while broccoli and strawberries had to share? As far as I can tell, the only thing that made dairy so “special” was the calcium. So calcium had to be special – a perception at least tacitly encouraged by vast expenses in both advertising and lobbying.